I hate driving. Well, hate is probably too a strong word. So, maybe it is not hate. But I certainly seem to have my biggest negative visceral reactions when I think about driving. Ugh. So, I drive as little as possible and it actually suits me well. However, I do have to get to meetings, shop for groceries, take the kids to practice, visit friends, go to the doctor and a lot of other tasks that are not at my home, so I need to get there somehow. I know a secret that most Americans don’t know; there are other means of transportation besides a car! My chosen form of transportation is biking. And I find it very slow dwelling. There are lots of benefits to biking. I get exercise, drastically reduce what we spend a year on transportation, they are easy to park, it is very low carbon, gets me out into the elements, helps me limit where I will go and I just enjoy getting out to ride. There is a type of freedom to it. In 2010, we chose to sell a vehicle (we were a two vehicle family) and buy a dutch bike. We get a lot of use out of it. 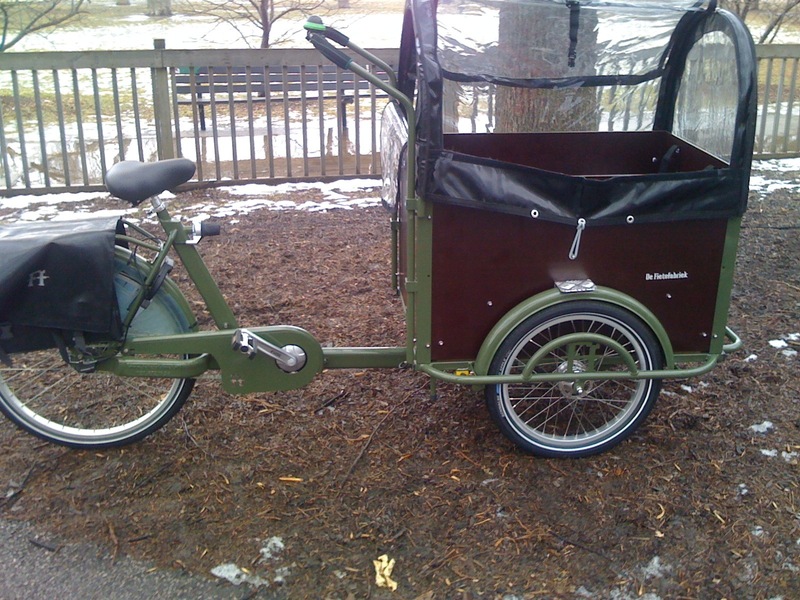 Just today I went to pick up some food from a caterer for a local event at our school and used the dutch bike. I just rolled up to the door, packed up the food, rode to my girls school, parked at the front door and dropped off the food. It couldn’t have been easier. One of the great things about the dutch bike is that you can fit four kids or up to 256 lbs. in the front. When I have the two girls in there and they have a friend each, it is like a party in that thing as we are rolling down the street. They are laughing and giggling and having a blast. As a year-round biker in Chicago, where it can get to below freezing in the winter, I find that if I have a system for dressing properly, it makes it super easy to be ready. I have a super warm winter jacket, gloves, mask and old snowboard helmet/ goggles. So if I want to head somewhere, it is easy to just grab my stuff as it is all ready. No need to go find everything, it is all in one spot ready to go. The one down side to riding a bike is that thieves are always looking to steal them. When I had my second bike stolen, I decided to buy the cheapest used clunker bike I could find with bolt on wheels and seat, nothing fancy so that the bike thieves would not give it a second look. I bought it at WorkingBikes.org on Western in Chicago for $80 about 4 years ago. Since then, I have added fenders to keep the rain from splattering up on me when I ride. They cost about $100. So I have invested about $180 in that bike and probably riden it over 10,000 in the last 4 years. If I do a quick calculation, my cost per mile is about $0.018. The Government believes it costs about $0.555 per mile, so riding a bike has saved me a lot of money (and headaches). Now the key is getting the rest of my family involved in our biking culture. We started by getting my wife an upright commuter bike. I wanted to make sure that she had a really comfortable bike that fit her so that she would have as much fun as I do. I have to say that I am very impressed with how she has jumped on board with the biking. She now bikes probably 8 months a year (and takes a lot more public transportation when she can’t bike). We then set out to make sure that our girls were comfortable at riding a bike. They are both doing great and now we go on family rides. It is a blast.